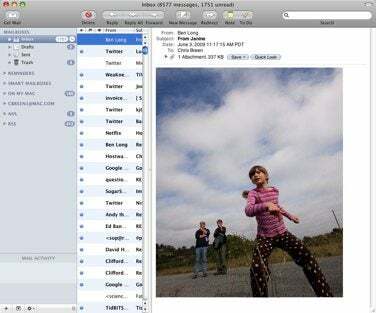 I seem to recall some mention of an application that allowed you to view Mail messages on the right side of the Mail window. I can’t find that application. Can you help me find it? My guess is that you’re talking about either Aaron Harnly’s free Letterbox or Dane Harnett’s equally-free-but-donations-welcome WideMail. Each is a Mail plug-in and each performs a couple of additional tricks. Letterbox lets you place the preview pane on the right or bottom (Mail’s default setting) of the message list. You can also configure it to show or hide alternate row colors and show or hide line dividers between rows. And you can choose the look of the preview pane divider—normal or hairline. With Letterbox or WideMail you can put the preview pane on the right side of the Mail window. WideMail has a few more options. As with Letterbox you can choose to show the preview pane to the right or bottom but you can also choose to show or hide relative dates, change the grid style (so it shows vertical or horizontal lines—or both), change the color of those grid lines, and alter the spacing between cells (from 0 to 20).